Rheumatic Heart Disease (RHD) starts innocently enough, as a mere sore throat or an infected skin sore, but it escalates worryingly quickly. If left untreated, RHD can lead to open heart surgery, stroke, or even heart failure and death. It is a dangerous disease that affects 30 million young people worldwide, claiming up to 1000 lives per day. “It impacts on the most vulnerable people in our community and the consequences of this are disastrous”, says New Zealand GP Dr. Lance O’Sullivan (2014 New Zealander of the Year). As dangerous as RHD is, there is a truth behind it that is even scarier. Rheumatic Heart Disease is 100% Preventable. “The tragedy is that it affects kids, we know the cause, and that we know how to get rid of it,” reflects Professor Jonathan Carapetis of RhEACH Australia. If Rheumatic Heart Disease is entirely preventable with modern medicine, then why does it still affect so many young people around the world? The answer lies within the communities where RHD is most commonly found: Remote and rural communities in Australia’s North and New Zealand. Poverty, poor living conditions, overcrowding and a lack of proper medical care have all contributed to the continued survival of this condition. As said by former President of the World Heart Federation Professor K. Srinath Reddy “It is actually a disease of poverty and overcrowding”. Just as scary is the thought that this issue passes by with very little recognition compared to other diseases. “If you had a similar outbreak of measles or meningitis or even ebola around the world, it would make the headlines in the news whilst this is not something of which the general public is aware,” cautions Dr. Bo Remenyi. Perhaps that is starting to change, with a screening of this short film at the United Nations Headquarters in New York on World Heart Day. This film aims to raise awareness for this preventable yet life-threatening condition, so that we may finally put an end to it. 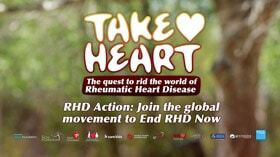 Watch Take Heart Short Film ‘What is Rheumatic Heart Disease‘ to learn more.